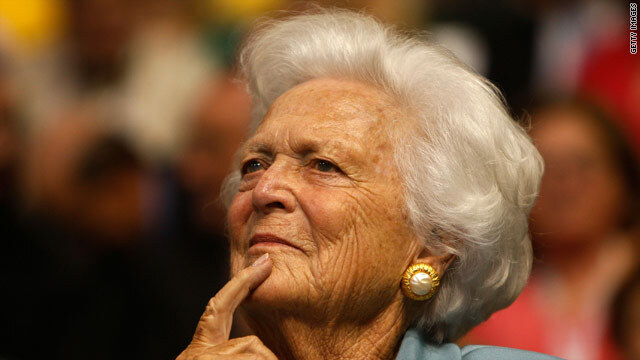 Cincinnati (CNN) – In another sign the GOP establishment is coalescing behind Mitt Romney, former first lady Barbara Bush recorded a robo call for the Republican contender's campaign. The robo call featuring a brief message from Mrs. Bush began ringing households Saturday in the critical Super Tuesday state of Ohio. "We have known the Romneys for years and believe Mitt is the best man to lead the country for the next four years and Ann will make a great first lady," Mrs. Bush, who says on the call. The robo call is also being used in Vermont, another state that votes Tuesday. Former President George H.W. Bush announced his support for Romney in December. The couple's sons, former president George W. Bush and ex-Florida governor Jeb Bush, have yet to endorse a candidate. The GOP old-guard is coming out to ensure the fat-cats get their errand boy. The Koch brothers will have Romney as their own dancing monkey with magic underwear! Gotta love Barbara Bush. Bless her heart. Soon we will be saying Good-Bye to Obama and HELLO to President Mitt Romney!!!! Obama promise change. Where is it? Just bla=-bla=bla. That was not a good idea to remind people about Bush clan. Why didn't they ask Nancy Reagan do the robo calls. She is old yes but not too old to talk! What a surprise, the Bush Crime Syndicate endorses GWB V. 2.0 to continue their elitist attacks on the poor and middle class. Given the neocons and other pscyhopathic weasels Rmoney has surrounded himself with, this is about as startling and relevant as the sun rising in the east. Haven't we had enough of the Bush's???? The last thing that would sway me is an endorsement from one. They have done enough damage. Interesting to see the mafia endorsing Rmoney too. Like most Americans, I'm not quite ready to go there!!! THIS STORY: If the Republican party wasn't so picky from the beginning – they will be further than they are now!! Romney will win the nomination and then go on to lose in the General!! Obama 2012 – The Only "Trusted" Way Forward!! !